The Hyperloop is not real. But that won’t prevent it from being taught at institutions of higher learning. Now Purdue University is offering a Hyperloop Design course through its three engineering programs. The first class was yesterday and apparently 54 students showed up. 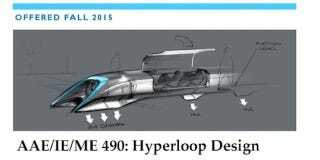 The course is being offered at an interesting time in Hyperloop’s development. Earlier this summer, Elon Musk announced he would build a test track and host a design competition for the Hyperloop’s pods. Then, last week, the startup that’s kind of run with Musk’s original idea, Hyperloop Transportation Technologies, announced it’s building its own test track, with a long list of partners including transportation engineers at AECOM. Looking more closely at the rules, it seems like Musk’s competition was tailored to coincide with school calendars: The deadline to register is 9/15 and the final submission is 12/15. I’m actually surprised now that we aren’t seeing more of these Hyperloop classes, although some professors may simply be giving it as an assignment as part of their existing courses. I also found some evidence that schools like the University of Illinois are putting together teams to compete, if not offering classes outright. Update: Texas A&M also has a course. Here are all the details. Perhaps they’re taking late-adds should you find yourself enrolled at Purdue for the 2015-2016 academic year.